Applications for the nationwide Hostplus Hospitality Scholarship supported by Melbourne Food and Wine Festival will open on Thursday 15 March. Now in its fifth year, the prestigious Scholarship offers the next generation of Australian hospitality workers a once-in-a-lifetime opportunity to work across three different countries in internationally acclaimed hospitality businesses. On their return to Australia, the Scholarship winner will be partnered with a local industry leader for a year-long mentorship, furthering the opportunity to expand their industry experience and make valuable connections in their chosen field. This year, three shortlisted finalists will also be invited to participate in an exclusive development day with Hostplus ambassador Shane Delia, acclaimed Melbourne chef and hospitality business owner (Maha and Biggie Smalls). 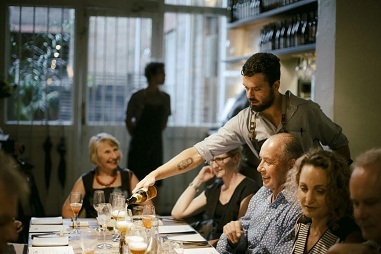 Joined at the table by partners and producers from the breadth of his business, Shane will share inspiration from his extensive travel, plus insights to his progression through Australia’s dynamic hospitality industry. Scholarship applications are open to hospitality workers across all areas of expertise: from the paddock, the cellar, the kitchen, front-of-house, and everywhere in between. The Scholarship prize will be facilitated by Melbourne Food and Wine Festival through its extensive global network and the winner’s international work experience will be specially tailored to their career interests. The 2017 Scholarship winner, Caitlyn Rees, is the head sommelier at Charlie Parker’s and Fred’s in Sydney. Later this year, Caitlyn is due to embark on her scholarship journey working at venues in both the US and Europe. The judging panel for the applications features leaders from across the hospitality industry: Gail Donovan, restaurateur, Donovans, Melbourne;Umberto Mecchi, chief marketing officer at Hostplus; Jo-Ann Moody, gastronomy manager, Melbourne Food and Wine Festival; Rafael Rashid, founder and owner of Beat Box Kitchen, Taco Truck, and All Day Donuts; Matteo Pignatelli, owner and operator of Matteo’s restaurant in Melbourne; and Fleur Studd, owner of Melbourne Coffee Merchants and co-founder of Market Lane Coffee. Online applications for the Scholarship open on Thursday 15 March and will close 5pm, EST on Friday 4 May. Applications are open to all Australian residents aged 22-35 and currently working in any area of expertise within the hospitality industry.